Free full 2017 Calendar Template with US Holidays. 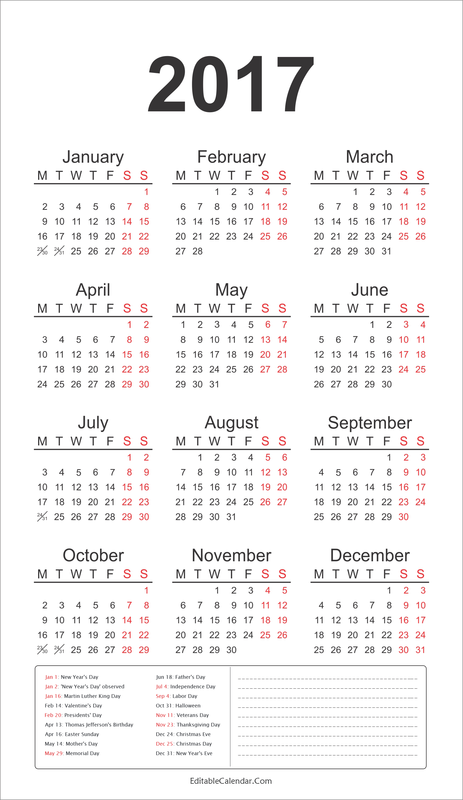 This calendar have full 12 months in one page and include all US federal holidays. It also have space for notes too. Jan 2 – ‘New Year’s Day’ observed. Jan 16 – Martin Luther King Day. Feb 20 – Presidents’ Day. May 14 – Mother’s Day. May 29 – Memorial Day. Nov 23 – Thanksgiving Day. 2017 calendar template with holidays.